We arrived in Siem Reap Cambodia late in the evening and hopped into a tuk-tuk for a ride to the hotel. A Cambodian tuk-tuk is reminiscent of a covered rickshaw but with the runner replaced by a motorcycle and the carriage with two sets of facing bench seats. All seemed perfect. The streets were relatively empty, a light breeze from the ride added a cooling touch to the warmth and humidity. The tuk-tuk passed a long line of hotels filled to the brim with cars and tour busses then left the main road and headed down a side street before eventually turning onto an unlit, unpaved road that looked more than a bit ominous. My wife and I looked at each other nervously both flashing back to an unpleasant experience we had with a bicycle carriage driver in India. Our heart beats quickened as did our breathing. Until the Cambodian tuk-tuk driver stopped at a lighted entranceway with a sign letting us know we had arrived a Eureka Villas, the hotel we had contracted through Booking.com. We both breathed heavy sighs of relief. This was an honest tuk-tuk driver. His American name, he told us, was Tom. A quality driver is a god send and, when you find one, they are worth their weight in gold. We signed Tom up for the next day and ended up using him for every trip our entire stay. Our hotel, the Eureka Villas, by the way, is one of my two all time favorite hotels. It was quaint, beautiful, spacious, had an amazing staff, and was priced way below what I expected to pay for such luxury. We were in Cambodia to visit the world famous Angkor Wat Archeological Complex, the largest religious monument in the world, home to the ruins of many ancient temples. The temples were originally Hindu that transformed to Buddhist around the 12th century. It had long been on our bucket list so, while visiting her family in the Philippines, we took a side trip to Angkor Wat, a short four hour plane ride to one of the most visited places in all of Asia. Walking out of our hotel room we were full on assaulted by the heat and humidity and it was only 9am. Almost immediately, I could feel the sweat come rushing out of my pores. I was just two days out of Chicago which was still on the frigid side and my body had yet to adjust to seasonal hot weather. I was wearing long pants (a decision I would regret later in the day). We were planning on visiting the inner sanctuary of Ankgor Wat which from my reading required men and women to be modestly dressed. Modest generally means long pants and shoulders covered. If one is visiting a Mosque, it also means head coverings. The inner sanctuary we would be visiting was Buddhist which didn’t require any head wear but was strict in the other modesty requirements. Tom picked us up around 10 am after a tasty hotel breakfast. We made sure to get the cost of the tuk-tuk up front. We didn’t want there to be surprises like the time in Delhi when the bicycle taxi driver asked us for a ridiculous number of rupees. Rule of thumb is always get the cost before getting in the vehicle. 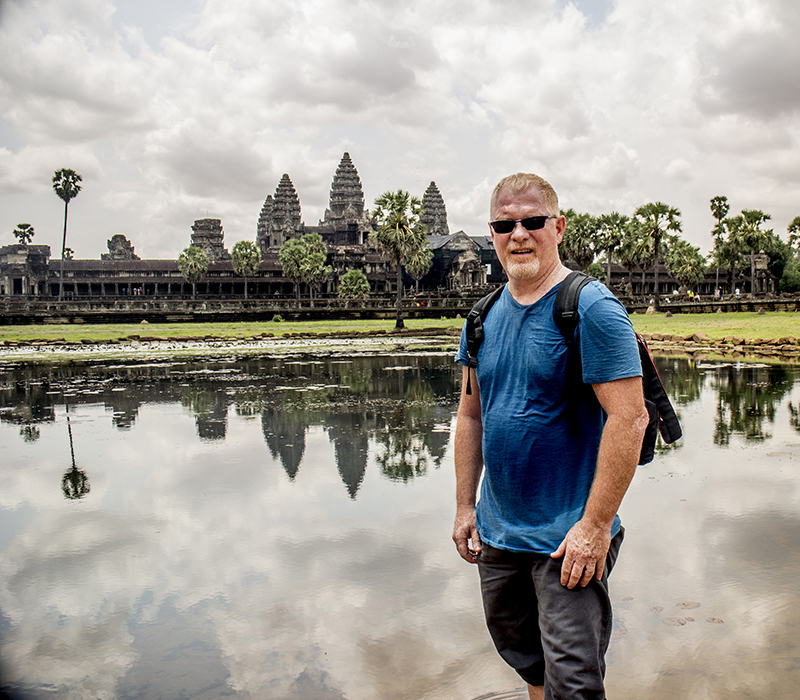 By the time we arrived at the massive Angkor Wat temple, it was already sweltering. We walked the entrance bridge over the waterway in the heat of the direct sun and passed through the outer entrance way. We quickly skirted to the left to take a roundabout way to the temple proper. This ensured our walk would make ample use of shade but also took us through the gauntlet of local vendors. The vendors, mainly women, were selling tourist goodies. The first to stop us were the food vendors offering beer and water and pop. My shirt was already half soaked so we stopped in for a cold water. We sat at a table named ‘Ram Bo’ where the woman brought out two cold waters and turned on a fan. The fan, she said with a smile, was free. These types of vendors are at tourist sites the world round. However, there were two things that surprised with the vendors here. Despite the extreme heat, the women were wearing jackets, scarves, and gloves AND there was not a bead of sweat anywhere on their faces. I had been out for near an hour and was mostly drenched from my own perspiration and they were looking cool as can be! I was also surprised that the vendors here did their business in US dollars. They didn’t want Cambodian Reals – their own countries money. We had exchanged some money at the airport, it was just over 4000 Reals to the USD, to ensure we had the local currency which turned out to be useless. All our transactions were in USD. I have experienced other countries wanting USD then always giving change in the local currency. Here the change was also in USD. Angkor Wat’s central structure has massive, pillar lined, shaded walkways surrounding the temple. This surrounding walkway measures 204 yards by 235 years. We walked these marveling at the intricate scenes carved in the walls. The carvings are known as bas-reliefs. They represent historical and mythological scenes. Some were of epic battles waged in the days of yore. Most did not photograph well due to the harsh lighting and the reflective surfaces. We were able to capture a few acceptable (to me) pictures. At the center of the temple towering high over the land was the shrine. This was the section for which I had dressed in long pants. As we approached the guards that monitored the entrance, we came to a sign indicating what was and wasn’t permissible to enter the temple. It turns out, I could have worn knee length shorts instead of my long pants. Covered shoulders, though, were still a must so I would not have been able to wear one of my sleeveless shirts. For the remainder of the trip, I did go sleeveless and carried a couple of extra shirts in my backpack, one with sleeves for temples, both to swap out when the shirt I was wearing became completely soaked with sweat. The steps up to the sanctuary were very steep. Many people, upon exiting, were to afraid to walk down the steps. The sat on their butts moving own one step at a time while holding the handrail with two hands. After marveling at Angkor Wat for a good three hours, we found Tom and headed for Bayon, the temple of big heads. The short ride provided some much needed cooling. During our time at Angkor, I was feeling the effects of the heat. My pants were rolled up to my knees giving me a measure of relief but my shirt was soaked so I could not lose any heat from my upper body. Walking in the near 100% humidity felt like treading water without the cooling relief of actually being in water. Bayon is home to 216 of these serene faces that range in size from 10 to 15 feet in height. The temple is much smaller than Angkor Wat but the Khmer style construction is similar except, that is, for the big heads. Making our way into and around the temple was difficult for me. The internal heat was continuing to build and I was starting to feel pain in my body. I stopped a few times to just relax in the shade and drink water so I could get up to the 2nd level with the heads. I loved the big heads for their size and the serenity they exuded. For some time, walking in their presence surrounded by silence, my countenance seemed to absorb the sereneness. My pain subsided. I was feeling better over all. On another day, I could see myself spending an entire day at this one small temple. There were so many rooms to explore, so many wall carvings to admire, so many angles of the massive heads to interpret through my camera lens. But it was not to be today. For one, I was not properly dressed to endure the intense heat. Secondly, because ‘they’ arrived. They were many. They were obnoxious. They were loud. Their shrill voices pierced the silence deflating it and my serenity like a giant balloon. Ten to fifteen years ago, ‘they’ would have been the caricature of obnoxious – the American tourist. My travelers over the past years has experienced a significant decline in the ugly American expecting the world to speak English and talking down to the locals. Part of the problem was that American’s rarely left the USA. Consequently, they lacked experience with other cultures and didn’t understand that the world (Canada excepted) is not an extension of the USA. They aren’t gone by any stretch of the imagination. The year before I encountered an American man red faced, raising his voice at a hotel clerk telling the young man behind the counter to, “just do what I tell you to do!” It seems the clerk had charged the room to the man’s US credit card instead of taking the Rupees the man had with him. This would cost the man a couple of dollars extra. For him, that was reason enough to berate another human being. The ugly American traveler has been surpassed (but not replaced – many still exist). And this isn’t just my opinion. I have read a number of articles bemoaning my exact experience. The ugly American traveler has been replaced by the ugly traveler from another country. It seems, wherever I travel, be it Las Vegas, Sri Lanka, Cambodia, the obnoxious travelers are present. Temples are hallowed ground, sacred spaces. One would not go into a church or mosque with raised voices. These ancient temples, like our own elders, are deserving of the same, if not, greater respect for their venerability. When we arrived the temple was relatively empty so we were able to experience the sacred in the whisper of the winds careening over and around the great sculptures. We were able to feel the sacredness in the echoes of generations of prayers stirred up by the exhalations of our breath. Soon, a bus load of the obnoxious tourists came and stormed into the temple. We could hear the din of their approach, hear the din increase to a dull roar as they climbed the steps to the upper level of the temple where we were treading lightly, feel the whirlwind as they spread out talking loudly, cutting in front of people taking pictures, snapping their own selfies as they climbed up on the walls. It became impossible to feel the sacred so exited quickly and worked our way to Tom. There was one more temple on our list for the day. The final temple on our trip, Ta Prohm, is famous for it’s part in the Tomb Raider movie which was partly filled at this location. Locally, it has become known as the Tomb Raider temple. This seems borderline sacrilegious. Other than the giant trees and tree roots seeming to grow out of these temples, I don’t remember much about this visit. I was wet, tired, and in increasing physical pain. A short rain added to the already stifling humidity. Every step felt like I was trudging against the surf of a raging sea. I had moments of lucidity when a spectacular sight like me at the tree below captured my imagination to such a degree that all I could do was stare with awe and wonder. How do these buildings stand under the weight of these massive trees? How do the trees remain standing when they have no soil in which to dig their massive roots? Many parts of this temple were in ruins. This is not surprising considering they were built in the 12th & 13th centuries giving nature 800 to pierce the gaps between the rocks with ever expanding roots that spread wedge the rocks out of their well formed structures. In the end, nature will reclaim the land. In the end, nature always wins. Humans can impose order for a period, for long periods. But, humans pass on. Civilizations crumble. It is then that nature with her infinite patience reclaims what was and always will be hers. How Does These Trees Grow? When we finally returned to the tuk-tuk, Tom looked at me with concern. “Are you ok?”, he asked. I could only nod my head feebly. The trip back to the hotel was less than an hour but seemed longer than all the plane rides I had taken to get to Southeast Asia. Every bump along the road aggravated my pain. I was feeling chilled in the open air ride. My head ached. I thought I might puke. When we finally made it back to the hotel, I took a warm shower then crawled into the awaiting bed. I had no dinner. No snacks. Nothing but a bottle of water. I fell asleep and didn’t wake up until the alarm sounded pre dawn the next morning. This entry was posted in Adventure, Buddhism, Cambodia, Culture, Exploration, Temple and tagged Angkor Wat, Bayon, Cambodia, Ta Prohm, Tomb Raider. Bookmark the permalink.